How have you been enjoying your milk tea? Whether you're a longtime fan or a newbie interested in trying out a few new drinks, you'll be pleasantly surprised with the milk tea recipes we have for you. Milk is one of the most popular coffee and tea additives in the world. Due to its natural sugars (known as lactose), it adds sweetness. Milk with fat in it (e.g., whole milk, half and half, cream, and 2% milk) can also add body and richness to tea. Generally speaking, milk tea is made with a base of black tea. These tend to be bold Assam teas and Ceylon teas rather than the self-drinkers from Qimen, Darjeeling, and Nilgiri. Milk tea can also be made with other types of tea, such as the popular matcha green tea. From Indian masala chai to Hong Kong milk tea to British-style milk tea, here are some of the many ways to enjoy milk tea. Similar to Thai iced tea and Thai Iced Coffee, this tea comes with a heavy dose of milk. It is served nice and warm and is a very soothing beverage. This Thai Milk Tea recipe contains both sweetened condensed milk and evaporated milk with just a little sugar, so it's perfectly sweet. This contrasts with the many spices like cardamom, cinnamon, tamarind, and vanilla and is perfect with a Ceylon tea. More commonly known in the West as "chai" or "chai tea," Indian spiced milk tea (masala chai) is a blend of spices, tea, sugar, and milk. It hails from India, where variations abound. The diversity of drinks beneath the banner "chai" has widened even further since the drink ventured out beyond the Indian subcontinent. You can explore recipes for Kashmiri chai and caffeine-free chai, as well as a step-by-step photo tutorial for making masala chai from scratch. It is said that the custom of adding milk to tea began in France and later took root in England. * Today, it is common for people in England to add milk and sugar to their tea, while in France people tend to prefer a bit of lemon in their brews. This guide to British milk tea includes an overview of tea in Britain, how to make a "perfect cup of tea" (a quintessentially British ideal if there ever was one), and how to add milk to your cup of tea. * The French weren't the first to add dairy to their tea. In the early days of tea, large pieces of compressed pu-erh tea from Yunnan, China, were traded to Tibet, where they were boiled with yak butter. Hong Kong milk tea is sort of a caricature of British milk tea. It's thick, extremely milky, and incredibly sweet. This is because sweetened condensed milk or evaporated milk is the core ingredient. The oddly fascinating and extremely easy beverage is also known as “pantyhose tea” or “silk stocking tea.” It can be adapted into a Hongkongese coffee-tea drink called Yin-Yang Coffee-Tea. Getty Images/"""IMAGEMORE Co, Ltd. """
Milky bubble tea (or "boba tea") was said to have been created in Taiwan as an after-school treat for children. Today, it is enormously popular in Taiwan, Hong Kong, and certain parts of the U.S. and Canada (particularly on the West Coast and in New York City). Variations abound, but this recipe with tapioca pearls and a homemade simple syrup captures the essence of the whimsical brew quite well. Technically an herbal infusion, turmeric milk "tea" has long been used in Ayurveda as a remedy for bone and joint health. It is also said to improve mental focus, so this is a nice morning or mid-afternoon drink. This warm and spicy tea is unusually pleasing and it's quite easy. Just be sure that you use almond oil because it is the only oil that works (trust us). We cannot finish up this list without sharing just one more iced tea latte and this one is very different than the Matcha Latte. It features a breakfast tea blend and moves this recipe into the 'wake-me-up' category for busy mornings. 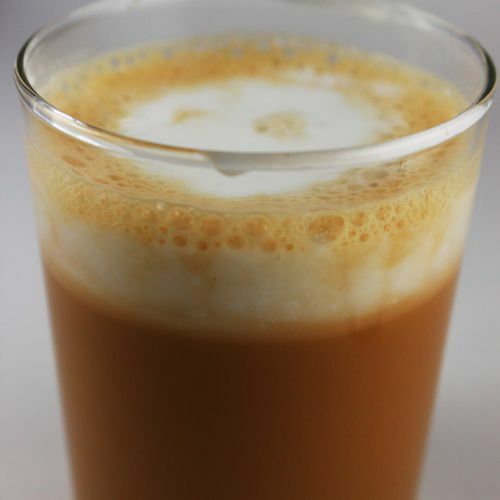 The recipe iced black tea latte is easy and is prepared a bit like an iced espresso latte, but with a black tea concentrate in place of the espresso. Thanks to the milk, it's filling enough to make a great breakfast on the go.